This entry was written by Princess Alethea and posted on September 22, 2013 at 12:43 pm and filed under contests, Hero. Bookmark the permalink. Follow any comments here with the RSS feed for this post. 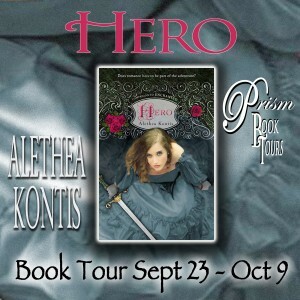 Hi Alethea, I saw your books on “I Am A Reader, Not A Writer’s” email and your books look fascinating. I loved fairy tales as a child, all the great stories. How do you become involved in a blog tour? My eBook just went live and I’m a little overwhelmed with the whole promotional thing. Any advice? Thanks. There are a couple of ways to do a blog tour. You can hunt down each of the bloggers/sites and approach them yourself (like I did last year) or you can hire a company like Prism Tours (which is what I did this year). A company will cost you money, but they take care of a lot of things like getting a schedule out there, coordinating te bloggers, and managing giveaways that will do things like increase your web traffic and twitter/Tumblr/FB followers…all that stuff you don’t have time for when you’re launching a book. I highly recommend it, but I also stress doing it the Hard Way first, so you know what you’re getting into, what you’re paying for, and what to expect (what your goals are). Best of luck with your release!